All our facials include extractions and exfoliation. Large pores are simply damage that shows up as you age. As you rid the surface of your skin from dead skin and impurities your skin will look more refined and smoother. Check "services-spa services" for more detailed information. Help reduce the signs of aging, sun damage, and scarring. The Power Peel™ Microdermabrasion is a crystal peel procedure that smooths the surface of the skin. Crystals burst onto the skin and get vacuumed up by the equipment, leaving the skin feeling much smoother. Collagen Induction Therapy, or Microneedling, is a treatment using an electronic pen shaped device, studded with very fine needles that penetrate beneath the skins surface to promote collagen fiber production, elasticity, and blood flow to the treated area. The process creates tiny wounds, breaking down old scar tissue and stimulating skin cells. Skin plumps and thickens, reducing the appearance of fine lines, wrinkles, acne scarring, large pores, hyper-pigmentation. There is no downtime or discomfort. Chemical Peels are topical acids and ingredients applied to the face to encourage increased circulation, hydration, and cellular turnover. Your skin will appear smoother, softer, more supple and youthful. With these treatments, your skin is stimulated to behave like younger, healthier skin. Level I peels are safe for any skin type. Included with you Level 1 Pewel Treatment is a customized lightening treatment using one of the following: Volcanic Ash, Vitamin C with Volcanic Ash or an acne spot treatment. The specific treatment will be determined by the condition of your skin. We offer many different strengths within the Level 1 category. Level II peels are not for everyone. They are deeper peels that reach the lower levels of the skin. There are cautions and specific home care protocols that are required before performing Level II peels. These peels may require some downtime, i.e. peeling. Contact your MediEsthetic Specialist for more information. 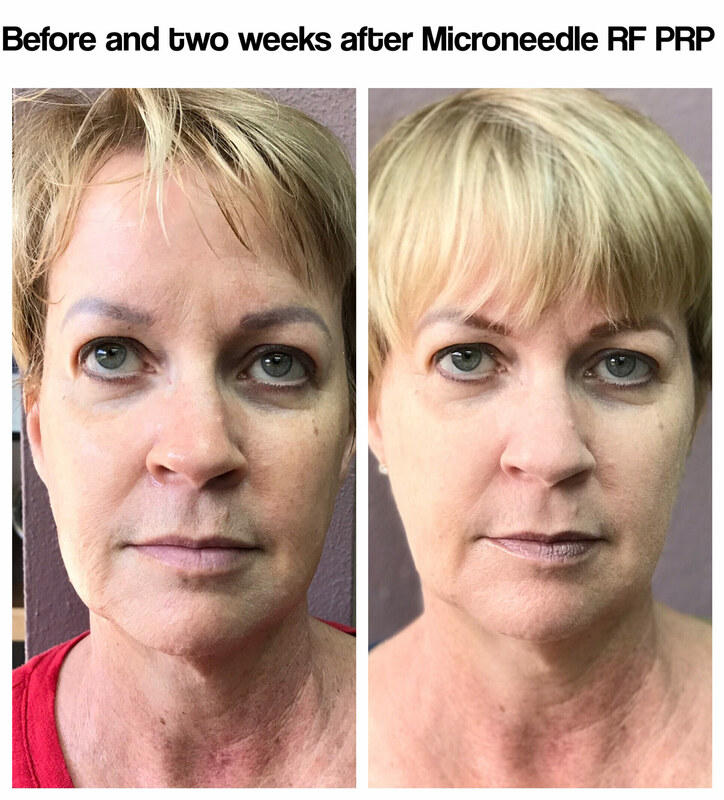 Many of you have done microneedling with us and many have done RF (Accent Prime is RF). Now we’re putting it all together! Microneedling with RF (radio frequency) and PRP (platelet rich plasma) is the next step. RF tightens collagen structures. It applies heat to the tissue and stimulates subdermal collagen production. It reduces the appearance of fine lines and loose skin. Our Accent Prime equipment has a hand piece that is microneedle and RF. The heat is applied deeper into the skin through the channels produced by the microneedles. PRP is platelet rich plasma. Dr. Val will draw one tube of blood from your arm and place that inside a centrifuge. The centrifuge separates the serum, platelets and white blood cells from the red blood cells. The plasma that contains higher concentration of platelets is collected and viola! – PRP. PRP contains many different and potent growth factors along with other proteins that stimulate the healing of soft tissue. Studies have shown that the growth factors in platelets can stimulate your stem cells resulting in the growth of new skin. Using microneedling to create tiny channels along the surface allows full penetration of PRP into the dermis, through the epidermis. Applying PRP topically allows us to get an even distribution of the PRP. This can be done simply with microneedle with PRP, also know as a Vampire facial. However, we do not produce bleeding. Microneedling with RF and PRP is more intense remodeling of the skin. Also, included is a post care kit.